Movie night is sacred to John and I and it’s something we enjoy doing together as a couple. John has a 2000+ VHS collection so we aren’t lacking in that department! I always like to get set up with some snacks, drinks and a comfy blanket. One of our favourite snacks to eat is popcorn. Movies and popcorn just seem to go together don’t they? We have tried various types of popcorn…the microwave kind in the bag, homemade version on the stove top, and the pre-packaged kind from the store. 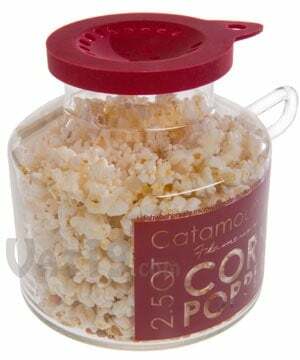 One product that I found really interesting and would love to see what it’s like is the Catamount Microwave Popcorn Popper. This is perfect if you like microwave popcorn (which we do), but don’t like the greasy popcorn bags (which we don’t). It’s also much more frugal alternative than spending extra money on those boxes of microwave popcorn in the store. With this particular product, you can buy your popcorn in bulk and save money. I’d imagine your popcorn would be much healthier too without the extra additives you find in some boxes of popcorn. It sounds like this microwave popcorn popper is easy to use. You pour your kernels into the 2.5 quart container and place your butter in the silicone melting lid. Then microwave for 2 minutes and 45 seconds. The butter will melt and drip through the lid to evenly coat all the kernels as they pop. This glass popcorn popper is dishwasher safe and the handle won’t burn you when you try to transfer your popcorn to bowls. It costs only $19.95 from Vat19. When I think about how much popcorn we go through in any given month, I know we would be saving money big time by purchasing this product! What a cool product! I checked the website and since this is no longer in stock .. I’ve requested them to email me when they get it in again! Thanks!